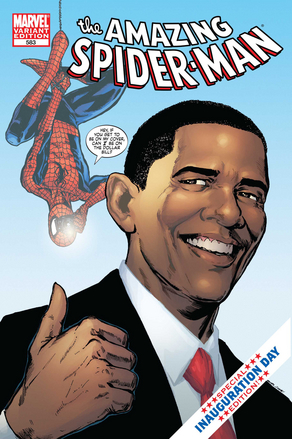 Barack Obama will appear on the cover of a special issue of Spider-Man to be released on January 14. Peter Bart of Variety calls Barack Obama America’s last Action Hero. There’s no new “Spider-Man” or “Iron Man” on the immediate horizon, but the superhero genre is alive and well. As evidence, consider next week’s inauguration. Historians cannot remember a moment when a president has arrived amid such lofty expectations. Barack Obama will not simply be sworn in; if he’s not careful he will be enshrined. Back in 1932, there were vague hopes that Franklin Roosevelt might help solve the Great Depression, but FDR was an unprepossessing patrician who spoke funny and sat in a wheelchair. Voters were more puzzled than expectant. If Barack Obama is going to bring this off, perhaps he should take note of a few of the traits of the superhero fraternity. “Iron Man’s” gift is that he has a strong moral compass. And he knows how to handle the military-industrial complex (it’s part of his family). “Spider-Man’s” relevant gift is that he can swing from situation to situation with amazing dexterity, never quite leaving a mark. That’s good politics. “Batman” is smart at choosing his battles. And, as he reminded us this last outing, he’s damn good at generating box office. Obama take note: Ticket sales are like votes. We can skip “Superman.” His outfit is a bit embarrassing and his ambiguities toward women keep getting in the way. 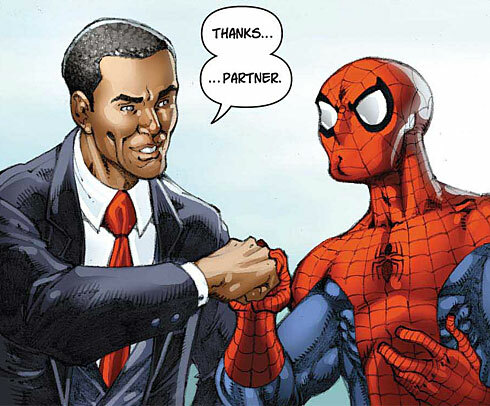 Will the superhero franchise come through for Barack Obama? Anyone who starts off with a trillion-dollar economic package needs all the showbiz tricks he can mobilize. There are lots of rumors going around regarding upcoming events on Terminator: The Sarah Connor Chronicles. Reportedly Jon meets his father, Kyle Reese in an upcoming episode. I assume that either this will be on a diffrent time line from the movie series, or maybe this will be an eariler trip back in time (from Kyle’s perspective) prior to the events of the first Terminator movie. Reportedly Riley did not die as it appeared at the mid-season cliff hanger, but such an outcome of a cliff hanger would hardly be a surprise. Shows such as Terminator: The Sarah Connor Chronicles have problems building an audience as many potential viewers are reluctant to come in on a story in progress. At the start of the season a decision was made to make each episode more of a stand-alone story. I doubt this would matter in a series such as this which has developed such a detailed mythology that new viewers would still have trouble keeping track of what is going on. Now they have decided to return to a more serialized format, which probably will work better in a series of this type. Sci FI Wire interviewed Brannon Braga on his planned show Flash Forward based upon the novel by Robert Sawyer. the show is planned to follow Lost and will even have one actress in common with roles on both shows–Sonya Walger. Brannon Braga, the onetime Star Trek executive producer, says that his ABC sci-fi pilot Flash Forward—in which the Earth’s inhabitants have a simultaneous glimpse of their futures, then must live with the consequences—is designed to reset itself each season, starting with a new flash and ending when the premonitions come true. “Yeah, the structure’s not dissimilar from 24 [on which Braga is a co-executive producer], and we want to reset the show at the end of each year, where we’ll do another flash forward at the end of the first season, and then potentially another flash forward at the end of the second season, each one kind of resetting the core characters’ visions of the future and introducing new characters,” Braga said in an exclusive interview on Tuesday, Dec. 6, at the Hollywood premiere party for 24‘s seventh season, which kicks off this weekend. The pilot follows a group of characters around the world who have to deal with the consequences of a 2-minute, 17-second glimpse into the future. The series is loosely based on Robert J. Sawyer’s novel Flashforward. The show features an ensemble cast, led by Joseph Fiennes, Sonya Walger, John Cho, Christine Woods, Jack Davenport and Courtney B. Vance, and is envisioned as a companion to Lost. Goyer directs the one-hour pilot, which goes into production in February in Los Angeles. “We just finished casting the pilot right before the holiday, and we just went into … official prep on it two days ago, so David is busy getting ready to direct, and we’re going to shoot it next month, right after President’s Day,” Braga says. American Movie Classics has shot a six-hour miniseries re-imagining of The Prisoner for modern-day audiences. One of the biggest changes in this re-imagining is that Six is now American, played by Jim Caviezel. The big event today is the first of two two-hour episodes of 24 airing today and tomorrow to start the season. Sci FI Wire gives eight reasons why 24 is really science fiction. Posted in Barack Obama, Science Fiction, Television. Tags: Barack Obama, Dexter, Heroes, John Cho, Lost, Sarah Connor Chronicles, Science Fiction, Sonya Walger, Spider-Man, Star Trek, Terminator, The Prisoner. RSS feed for comments on this post.. TrackBack URL.